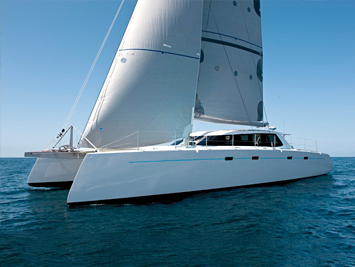 Fast, Sleek, Graceful Under Sail … it Must be a Westerly. Westerly Marine is a custom builder of high performance, advanced composite, racing and cruising boats. Meticulous attention to detail in all areas of construction and dedication to making every boat strong, light and of the highest quality assures total customer satisfaction. Westerly specializes in carbon fiber composite, and is one of a select group of boat builders worldwide that has the experience and capabilities to build complete, pre-preg, oven-cured boats. In fact, the company claims the first pre-preg Kevlar® boat constructed on the West Coast. Typically, each hull, deck and structural component is laminated by hand using pre-preg or wet preg epoxy resin, roller impregnators and employing vacuum bag techniques. As an industry leader, Westerly Marine keeps abreast of developments and remains on the cutting edge of technology. The company works closely with many of the world’s most prominent naval architects building a variety of different and innovative custom projects. Many of those are cored with Plascore Nomex® honeycomb. Westerly’s reputation for high-end composites has lead to work in the performance auto racing, international marine and lightweight panel markets. For more information visit Westerly Marine at www.westerly-marine.com.